Hello to everyone, this is my first post in the 907 forum after my introductory post yesterday in the announcement section. I have just acquired a 907ie in the UK and according to the "How many left?" website, there are only 6 907's in the UK. If that is the case, it would be nice to claim these on the forum and whether they are a 91 model or 92 Goldline Brembo model and what colour and Reg year! UK and now Global owners, please report in! It would be interesting to see also how accurate the how many left website is as this records SORN and Taxed vehicles. I imagine there may be some anomalies for this age of vehicle and those imported later may perhaps be registered in a different manner to the original importers?! Following development of the format below, here is the register as it currently stands, thanks to those who have contributed. Model year, last 4 digits of chassis number, colour, reg year, reg letter, forum username and by popular demand country. Thanks again to all of those who have submitted/contributed. Last edited by Nito on Fri Jul 13, 2018 7:05 am, edited 5 times in total. Post subject: Re: UK 907ie Register!! Nice bike, almost identical to mine except mine has Conti silencers. It is 1994 registered, although Ducati stopped producing the 907ie in 1992 so it must have sat around a dealer's showroom for a while. It is the late model with gold brake calipers and 320mm discs. That looks in beautiful condition. Nice picture too, where was that taken? Mine chassis number ends in 906 which is pretty cool I wonder how many reached our shores? We did have a member a few years back who was going to start a register but I think I may of upset him when I complained that some of the details requested were a bit to informative if you were looking for an interesting location for bikes if you get my drift. When I was sending emails to all UK registered members for some of my Paso gathering meets there was a surprising number of 907's owned/logged out there even if the owners didn't actually take much interest in this site. I have also probably seen about 30 different 907's come up on eBay over the last 6 years. and know of another 4 that went the way of a breaker of which all are still regularly showing panels and engine parts on Ebay so they have by the look of it a long shelf life. Actual motors taxed and insured is a hard figure to pin down as nowadays you can ride a bike for six months sorn it and take it off the road very easily. This is mine from August this year. She will be ridden throughout the winter when I have time and she behaves. 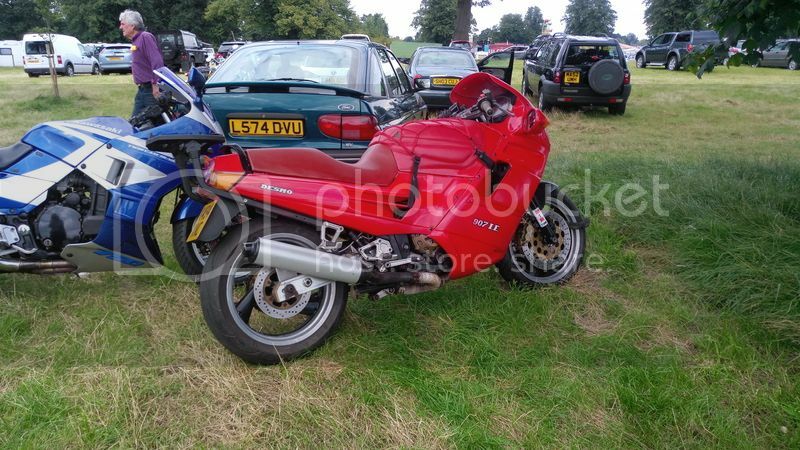 From those that I have spoke to there must be a handful on the road at any one time with a lot sitting in garages with owners ruing the day they thought they had a cheap investment bargain that just hasn't paid dividends unlike other Ducati's of the period. It is the Spitfire Memorial in Grangemouth, Scotland. Hi, thank you. I'm very happy to run a register and maintain it. I run the Tuono R limited register over on the AF1 forum for the 200 numbered limited edition launch special Tuono's of 2002 which has yielded some interesting info. How would you owners feel about volunteering the following info? Model year (91 or 92), last 4 digits of chassis number, Colour, Reg year and letter and forum username. If others want to submit that info below I can get the ball rolling and we can have a formal mechanism for owners to check in and build our own database as a useful resource for when people sell and buy 907's to help preserve the provenance of these classics. The how many left website does add SORN and Taxed vehicles and differentiates between them so catches the 6 monthly taxed as it shows the figures for both sorn and taxed per quarter. I have also seen more than 6 but there will be some variance according to the info submitted at the time of registration which would have been done by dealers back in the day I guess. Hence it would be more useful to just run our own and account for as many as we can. It may even attract more members to the site. All thoughts welcomed, and if you're in the mood, please add the above details in the format example above and see how it grows! That is more in keeping with what an online register should be keep it simple, keep it short & keep it neat. Why not one for the 906? etc ? OK, lets do this! Thanks for the info, I should elaborate MY is model year, not reg year. It's easy for the 907 as there is only '91 black calipers and 92 gold calipers, I'll need to be educated by others for the 906! Please when you submit info, can you do so in the format as below and with complete info so its just a copy paste excercise. Englishstiv, for the 906, you've only given 3 digits for last 4 chassis digits and no reg letter? Cheers folks Once we have enough take up I'll start a new thread and post a clean list on the first page. Last edited by Nito on Tue Oct 03, 2017 8:55 pm, edited 2 times in total. 0808 on the 906 and reg number is non standard so a dateless plate hence omission. Remember folk on this site also run the Paso 750 model and the early 750SS and 900SS bikes so you may get them asking to log into this. Another thing to remember is that a lot of folk don't come to this site unless looking for a specific answer as we have been around a long time so don't get disheartened by a lack of moral support. Last edited by englishstiv on Tue Oct 03, 2017 8:59 pm, edited 2 times in total. Ok thanks, I’ve edited it and put reg letter as H since its an October 90. Thanks for taking the time to put that list up and for the suggestions. I have added my details. Please note that Robbie Murphy sadly died as a result of an accident while riding his 907ie early last year. I’ve reordered it slightly so they are arranged in chassis number numerical order. If others can copy paste the below and add theirs in the correct order that would be great, or just add the details in the thread and I’ll add to the list. Sorry about this Nito and Derek, Robs tag was Black 907 so I omitted him from the list, but never realised I had stuck and pasted the Facebook list with his name listed. Sorry folks .